Unspoken truths will be revealed-and they will change everything--in this dazzling final chapter of the Shadow Falls: After Dark trilogy! Della Tsang is facing the toughest fight of her life-and the most personal. In her new role as an elite paranormal investigator, she's assigned a twenty year old murder case...and the accused killer is none other than her own father. Author keeps messing up names its driving me crazy. First Dellas sister is Joy then its Marla. Chases guardian Jimmy becomes Eddie and even the cat Socks got a gender change. Great end to a great series by an amazing author! I received an ARC from the author in exchange for an honest review. Another great book, by a great author! Della has been such an amazing character throughout the Shadow Falls series, that I am sad for her journey to be over, but hopeful we will get to hear more about her and other favorites in the future, since the film rights to Shadow Falls were picked up! Della is definitely a force to be reckoned with even more in Unspoken. I love that C.C. Hunter writes about strong women that don't always need to be saved by their man. Another hit for C.C. Hunter! Highly recommended! 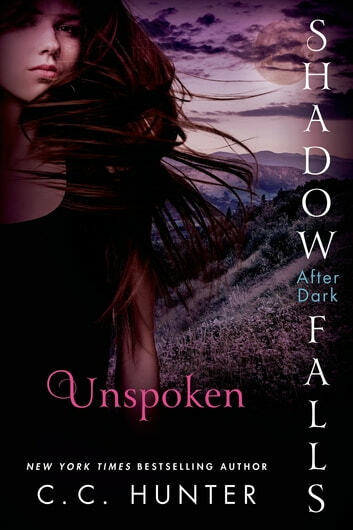 Reading this final book to Della's Shadow Falls: After Dark trilogy is just perfect. Don't miss out on any details of this trilogy. It will keep you up at night and you won't want to put it down. It's a great ending to the trilogy and you will be entertained by it. Della isn't your ordinary vampire. She is quick, smart, and daring. She will keep you wanting to read and reread this series over and over again. So make sure to get a copy of it! Enjoyed every minute and glad it ended with Della and Chase getting together. Can't wait to read more. Unspoken by C.C. Hunter is the third novel in the Shadow Falls: After Dark series. Della Tsang is vampire and attends Shadow Falls Academy (school for supernaturals). In fact she is a Reborn (turned twice) and is now bonded to the infuriating and handsome Chase Tallman. Della, though, has a lot going on in her life (besides adjusting to being a vampire). Her father is accused of murdering his sister, Bao Yu (who is now a ghost and following Della). His blood was found on the knife that killed her (his twin brother faked his death when he became a vampire). Della is determined to clear her father’s name. At the same time her elderly neighbors the Chi’s were murdered in their jewelry store. Mrs. Chi’s ghost has come to Della for help (Della is a ghost magnet). Della believes she saw who killed the Chi’s. Since Della is unable to work on her father’s case (though she keeps trying), she works on solving the Chi’s murder. She will have her work cut out for her especially when the police get an anonymous tip that leads to Della. Chase works on getting back into Della’s good graces (she keeps pushing him away despite her attraction to him). Chase quits his job with the Vampire Council and joins the FRU (Fallen Research Unit which is like the FBI). Della wants to become an agent and join the FRU when she graduates from high school. Burnett James (part owner of Shadow Falls—the school—as well as being a part of the FRU) is reluctant to accept Chase because he wants to protect Della (he is like a father to Della). Della wants to know that being with Chase is her choice and not because of the bond they share. Della also has not told her parents that she is a vampire. She is trying to hide it, but her father is treating her differently. Could her father, Chao Tsang, have figured out what Della has become? There is a lot going on in Unspoken. It is an interesting book (and told from Chase’s and Della’s point of view) but it was difficult to read with the foul language, teenage angst, and Della’s constantly being angry. The book also includes teenage intimacy. It was difficult to get into this book, but it gets more interesting in the second half of the novel. I believe in order to understand everything that is happening in Unspoken, you need to read the first two books in the trilogy. I give Unspoken 3 out of 5 stars. It was an okay novel, but I did not really enjoy this book (I actually found it very frustrating). A love triangle for teenagers seems a little hard to believe as well as teenagers doing adults work (but then they still act like teenagers with temper tantrums, crying, and disobedience). I think the novel would have been better with adults instead of teenagers (and the teenage angst). I love vampire, witches, and other supernatural novels, but Unspoken just did not speak to me. I received a complimentary copy of Unspoken from NetGalley (and the publisher) in exchange for an honest review.